October 24-25: the third All-Russian conference of NGOs dedicated to climate and energy issues and public participation was held in Moscow region by Russian Socio-Ecological Union. 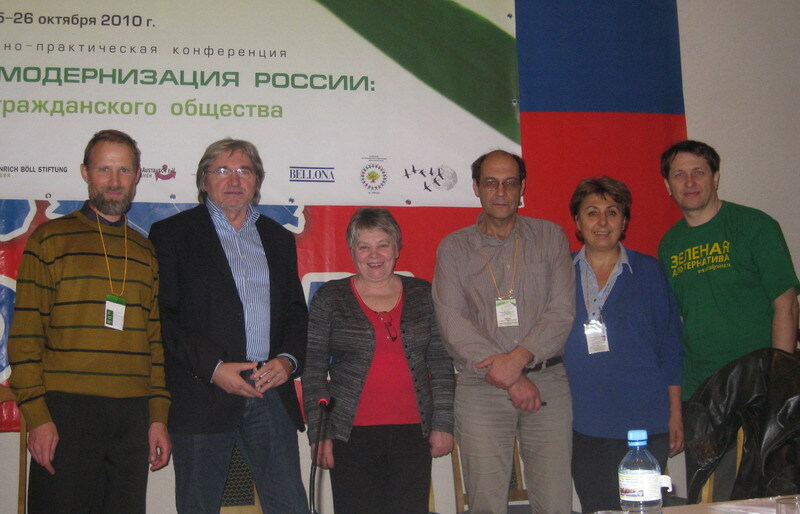 Conference on Eco-modernization of RussiaClimate change trends are constantly becoming more evident, and the changes are now happening at an increasingly rapid pace. WWF’s Alexey Kokorin (Moscow) presented the latest data that provides scientific rationale of causes and the process of climate change. The reduction of human impact on the enhanced greenhouse effect is one of the most important solutions to it, which significantly depend on a country’s policy and the implementation of low-carbon energy solutions. Georgy Safonov of Higher School of Economics presented Russia’s emissions growth scenarios depending on the extent of the implementation of such solutions. In 2009 Russia declared a 15 to 25% emissions reduction by 2020 compared to the year 1990. Since in 1990 Russian industry had its heyday, along with substantial emissions, Russia’s current emissions are now 35% lower than that, meaning that the declared reduction in fact signifies emissions growth by 10 to 12%. This precisely will happen if our energy policy remains inefficient and will fail to provide the conditions to support energy efficiency, energy saving and renewable energy in the nearest future. 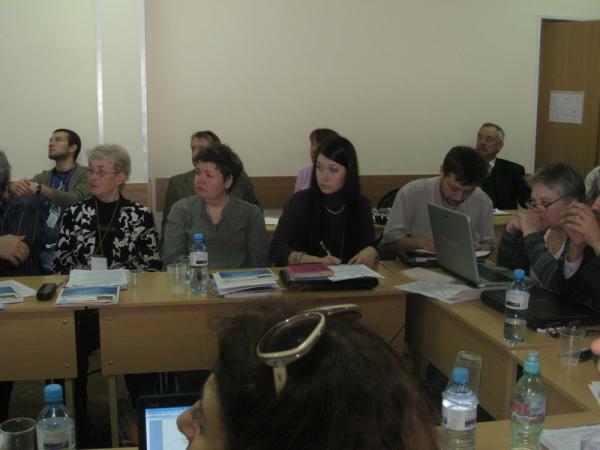 Participants of the Third RSEU Climate ConferenceActive steps are now being made towards energy efficiency: energy passports and energy efficiency improvement plans are created for state-financed organizations, according to Federal Law №261. Although, many heads of those organizations did not take part in the creation of such plans and passports, thus the latter do not quite encompass the actual energy saving potential. Goals to reduce energy consumption are way too low and do not fully correspond to energy saving potential of 40% as acknowledged by the Russian President. 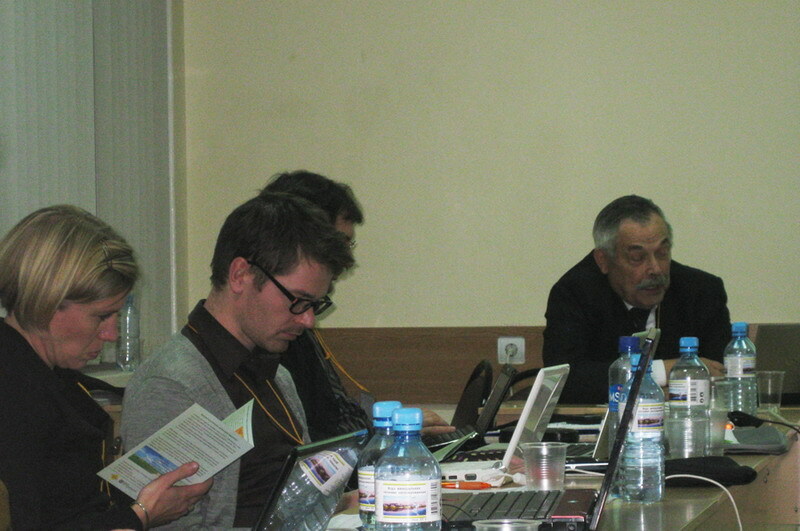 Participants of the Third RSEU Climate ConferenceAs for renewables, the situation seems much worse. The goal of 4,5% by 2020 stated in the Energy Strategy of Russia by 2030 is weak beyond measure. But even in order to achieve this one there is a dare need for governmental support of renewable energy that is currently absent. P.P. Bezrukikh of Institute for Energy Strategy presented his assessment of Russia’s renewable development capacity. NGOs mean that Russia’s international climate policy should correspond to Russia’s responsibility for the climate, the country being the 3rd top GHG emitter. 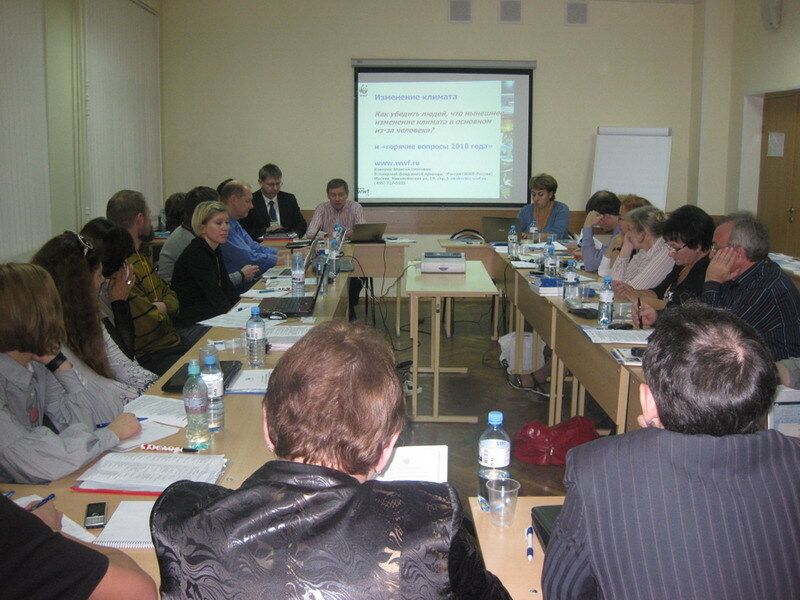 Alexey Kokorin presented the survey of the international climate negotiations process. Unfortunately, no international agreement projects of any real significance have been prepared for the coming UN negotiations in Cancun (Mexico). Participants of the Third RSEU Climate ConferenceAt international negotiations NGOs function as public observers. 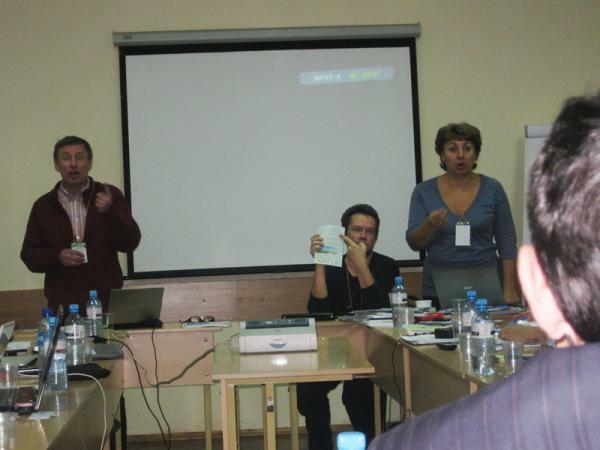 Alexey Ozharovsky shared his experience of NGO actions, work with mass media and official negotiators. The Climate Doctrine, signed in December 2009, implied an Action Plan to be produced that would cover the promotion of low-carbon solutions, among others. The has been no such plan so far. In order to implement the Climate Doctrine not only is there need for actions on the national level, but there has to be local and regional plans of actions too – that cover adaptation to climate changes as well as emissions reduction. Olga Senova of Friends of the Baltic presented the NGO view on diverse approaches to implementation and development of local climate and energy action plans along with the international experience in that area. In this respect the Climate Strategy of Wales can be an interesting example. The strategy contains very detailed plans for each sector (i.e. transport, agriculture, housing sector, population) that include annual numerical goals and actions to reduce emissions. Discussion on Climate Policy – Alexey Kokorin, Olga Senova, Andrey OzharovskijIn Sweden, municipalities strive to get the reputation of the most “environmentally friendly” ones, implement measures to promote public transportations and reduce avoidable trips by car. They look for possibilities to replace fuel-based energy production with local renewable sources, e.g. plan to set up solar panels and collectors on noise protection barriers by motorways. In Russia, according to presidential Decree of August 18, 2010, regional authorities and local self-government bodies are to some extent held responsible for energy efficiency and energy saving . The Decree states that governmental bodies should address energy efficiency and energy saving and report on that. Unfortunately, the Decree does not suggest any mechanisms to support the implementation of energy efficient solutions. Pavel Bezrukih speaks about Russia’ renewable energy resourcesNo significant steps in terms of local climate policy, local adaptation and emissions reduction plans have been made. As for energy efficiency and energy saving, 6 pilot projects have been announced, that are supposed to show the potential at the local level. One such project is called “The energy efficient residential quarter” and was presented by Elena Kruglikova of Kola Environmental Center, Apatity. KEC was active enough to join the project’s working group. Its information resources as an NGO and the experience in promoting energy saving solutions in schools and houses (accumulated as part of working in SPARE project as well as a number of other public energy saving projects) give KEC the opportunity to contribute a lot to the presidential project. A whole range of interesting materials was presented at the conference, e.g. the view of diverse specialists from governmental bodies and NGOs on climate change and its consequences, on energy policy, European approaches and the offered international financial mechanisms of carbon regulation, Russia’s resources and opportunities to develop low-carbon solutions. The conference’s participants adopted a Decicion that reflects the NGO view on the necessary governmental decisions to support an active climate and energy policy.